In the waning days of the Targaryen rule - and the Mad King's sanity - a loyal vassal saw the writing on the wall. In the dead of night, the Red Cofferer spirited away a king's ransom of the Targaryen treasury, to keep safe for the next dragon to sit the Iron Throne. Then Robert's Rebellion came to fruition, and there were no more dragons. But now a single criminal, newly bound for the Wall to Take the Black, says he knows the whereabouts of this great treasure, offering it to your players' noble House if they will free him. But he is not the only one who knows of this Dragon's Hoard, giving rise to a grand pursuit across Westeros and into Essos in search of this great treasure. 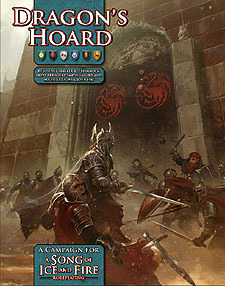 Dragon's Hoard is an epic chronicle in five parts that will take your player's noble house from the comforts of their home domain to tourneys, pirate coves, and even far-flung Braavos!